Puerto Rico continues to struggle following the recent hurricanes. Here is a link, to an ARRL report on ham radio operators sent down to assist with communications. Note the references to generator fires, generator failures, hospital evacuations, and shortages of food, fuel and water. This week, the team relayed a request for Culebra Hospital, which reported that a generator fire had forced relocation to a nearby clinic. In addition, volunteers relayed a request from Culebra Hospital that it needs temporary housing from FEMA for necessary staff members who lost their homes in the hurricane. The team also relayed a message for Hima San Pablo Hospital in Fajardo, which needed specialized IV fluids for a 4-day-old infant. 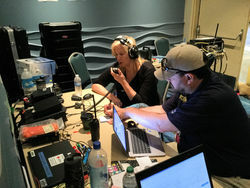 Val Hotzfeld, NV9L (left), and ARRL Emergency Preparedness Manager Mike Corey, KI1U. An Amateur Radio operator has been assigned at Centro Medico (Medical Central) to provide communication between the center and other hospitals. “This happened just in time, because the Menonita (Mennonite) Hospital in Caguas had both generators fail,” Hotzfeld said. The emergency room doctor at Medical Central and the ham embedded there, Juan Trujillo, N0PSF, coordinated with Dennis Perez, WP4Q, at the Mennonite Hospital in Caguas to transfer four critical patients to the Mennonite Hospital in Cayey. Volunteers at the EOC relayed a request from Guayana Hospital for snacks, water, and a generator. Their second generator was reported to be about to fail. They also relayed requests from hospitals for fuel and water, and they provided communication for fire departments contacting the EOC. Brushbeater blog posted a short Reflections on Puerto Rico, discussing communications preparations in light of lessons from Puerto Rico. Can you rig your own wire antennas? Do you have the rough calculations to make them resonant? Do you have the current consumption of your various radios written down and a way to monitor it? How long can you operate battery-only? Do you have enough spare equipment to keep your station up if Murphy happens? But most important- how many people can also do what you do in your group? Four deaths and ten suspected of infection are being investigated as possible cases of leptospirosis, a disease spread by animal urine, possibly from drinking contaminated stream water. Meanwhile some desperate Puerto Ricans are reported to be drinking possibly toxic water from superfund cleanup sites. 34% of Puerto Ricans are still without access to fresh drinking water. Rotting garbage may be the next health crisis there. Three weeks after Hurricane Maria ransacked this island leaving at least 44 dead, Jose Vargas surveyed street after street lined with mounds of soaking garbage mixed with mud, trees and sometimes dead animals. You couldn’t make a better breeding ground for rats, roaches and all sorts of nasty diseases, the public health volunteer said. And every day the fetid piles stay there, the risk of an epidemic grows. “We’re already building the next disaster,” he warned. Posted on October 16, 2017 October 16, 2017 by lvassemblyPosted in Current EventsTagged disaster, hurricane, puerto rico.